Gospelflava joins with countless others across the country as we acknowledge the passing of Little Lucy Smith Collier on Sunday, September 18th. Collier came from deeply religious roots as her grandmother, the Elder Lucy Smith, founded Chicago’s All Nations Pentecostal Church. Elder Smith was one of the nation’s most prominent black ministers and the church’s Sunday night Broadcast was heard across the United States in the 40s. Collier became a member of the Roberta Martin Singers during the Golden Age of Gospel, serving as pianist and organist for the group. 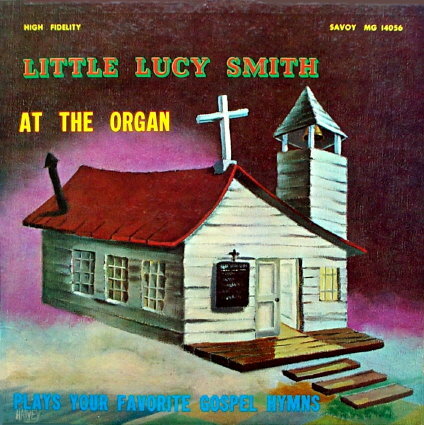 Collier’s adeptness on the organ would earn her an instrumental LP on the Savoy label, Little Lucy Smith at the Organ in 1962 (see album cover above). In the 90s, Collier joined fellow Martin Singers Eugene Smith, Delois Barrett Campbell, Robert Anderson as well as Donald “Preacher” Gay, Mildred and Geraldine Gay, Vernon Oliver Price and others on The Soul of Chicago, produced by Anthony Heilbut for Spirit Feel/Shenachie Records. Earlier this year, Collier was part of the inaugural induction of Living Chicago Gospel Legends presented by the Gospel Music According to Chicago organization.